Mr. Tre helps students work on their graphic design project. For most students, Art 1 is a class that is expected to be a breeze-through that students expect to pass by just drawing stick figures. 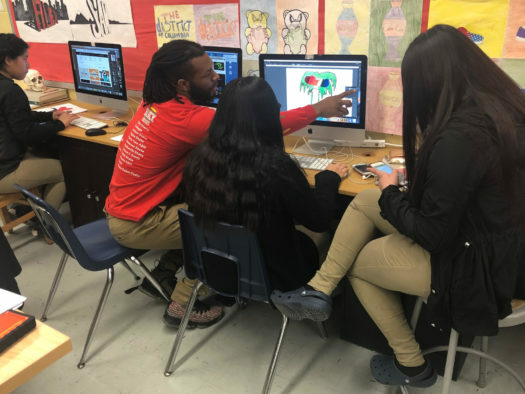 However, with Mr. Tremaine Wilkes, a new art teacher at Parkdale, students aren’t just going through the motions but are learning real-world skills that wouldn’t normally be found in an art class. Although teaching is a passion of his now, Mr. Tre didn’t always have this career in mind. He was born in Mocksville, NC and was raised in Thomasville, NC until he was 15 and moved to Maryland for his tenth grade year in high school. Here, he attended DeMatha for one semester and ended up graduating from Charles H. Flowers. After graduating high school, Mr. Tre attended Texas Southern University for a while before joining the military. That’s where he was introduced to computer graphics, where his skills were so advanced that his superiors feared that the high standards that he’d set wouldn’t be met by his replacement. “I literally had chief tell me ‘We’re gonna switch you to the video department because what you’re doing here in graphics is a little too good,’” said Mr. Tre. After his stint in the military, Mr. Tre returned to college where he had taken part in college football. Despite being a talented athlete since youth, Mr. Tre didn’t find same gratification in football that he did in his art. When it came to the idea of being a school teacher, it had not occurred to Mr. Tre until speaking with one of his college professors, Ms. Austin. Mr. Tre took his professor’s advice, came back to the DMV area, substituted for awhile, and then became full fledged teacher at Parkdale. In his first year of teaching, Mr. Tre was assigned to teach Art, but decided to construct a curriculum that challenged the status quo. A typical Art 1 class with Mr. Tre revolves around him showing his class a “thing” [a new artistic technique usually] and how to do it, ways to get better at it, some experimentation with doing the “thing” and then he assigns a project revolving the entitled “thing”. While Mr. Tre will always make it clear what he’s looking for in a project, he also wants students to outsmart him and create something that he never even thought of. However, giving students the freedom to have an elongated window of time to be creative, inventive and to work in a more hands-off environment has been a noticed challenge for Mr. Tre. While the “Whatever works for you” mentality may be a bell for many students to just draw a stick figure, claim it’s the best they’ve got and expect an A+, that type of attitude it doesn’t fly in Mr. Tre’s Art 1. In a class where students create their own logos, brands, business cards that will be created, worn, and shared in the real word, maximum effort is required. His experience of teaching art to Parkdale students is a continuation of his mission of educating young people about the importance of art, that surpasses the typical drawing or painting they may be accustomed to. In his art class, Mr. Tre wants to understand the whole student, not just their academic side. Sometimes he may be your teacher, sometimes your best friend or even sometimes your therapist if you need him to be. His ideas may be challenging and require work that may not be expected to be in an Art 1 class, but his expectations for a student who has completed the course is one that’s not commonly held for most electives in Parkdale.